When the Radical Mycology Convergence started in 2011, there were female organizers but largely male teachers. In 2012 organizers were pleased to see an influx in female presenters. This year, the Radical Mycology organizers, in collaboration with Female & Fungi, are continuing to make an effort to recognize women and trans folk in mycology. More than half of the 2014 organizing team are female identifying and we committed much of our time to ensure gender diversity among our workshop presenters. Click here to learn more about all of the RMC organizers. Come connect, learn and build community with us this October! 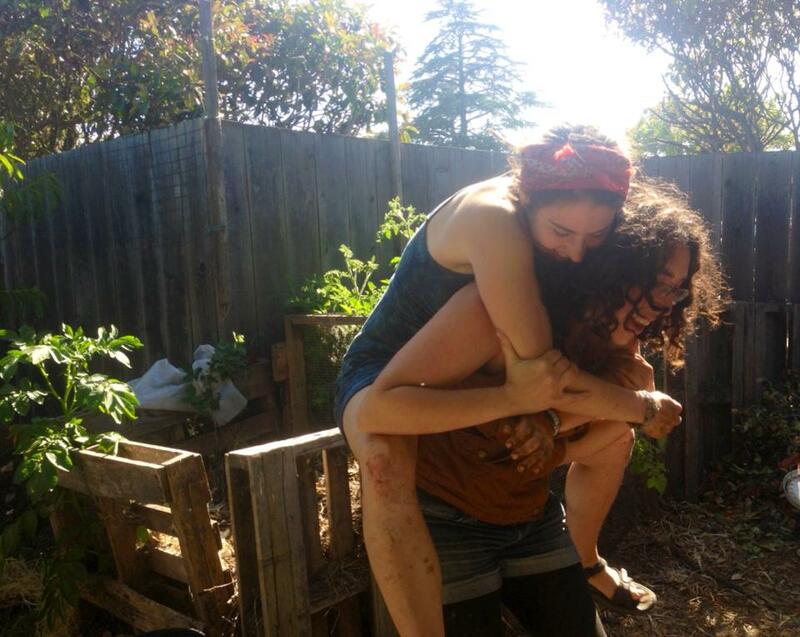 Mara Penfil and Leila Darwish, members of both Radical Mycology and Female & Fungi, enjoying a sunny day after installing mushroom beds in the garden. In 2011, a small group of environmentalists joined forces to host a a unique gathering of mycologists, mushroom enthusiasts, and Earth stewards alike. Since the initial gathering, the Radical Mycology Convergence (RMC) has grown to share skills and information with hundreds of individuals on the numerous benefits of the fungal kingdom for humans and the planet. Beyond the skills shared, the RMC works to build a community among like-minded mycophiles and community-based earth healers to collaborate on remediation and restoration projects during and after the RMC. Come October 2014, this 5-day event consisting of workshops, presentations, and various mycoremediation installations will make its way to Orangeville, Illinois, helping to strengthen the mycological community in the Midwest. “Our goal is to build a grassroots movement and network of people that work with fungi as allies in their efforts for a more sustainable and ecologically just future,” says Radical Mycology co-founder Peter McCoy. 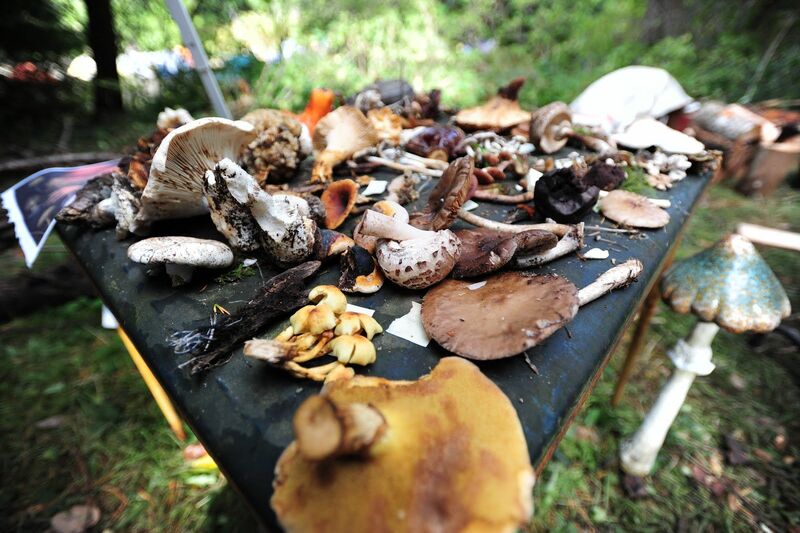 The volunteer-organized event aims to make information on fungi and their healing benefits accessible and tangible for as many people as possible without making it overly- heady or technical. 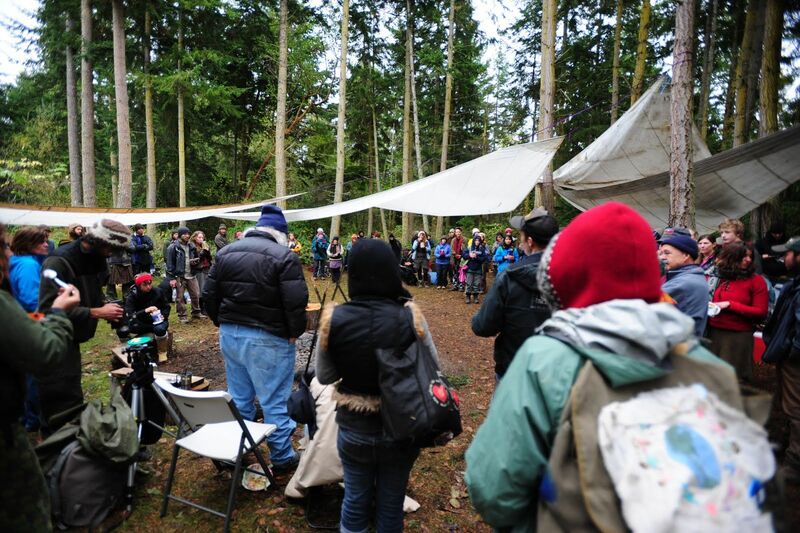 ”As a newbie to the field of mycology, I was nervous to attend my first convergence. I am proud to say, the RMC helped me to visualize my own potential as a cultivator, citizen scientist and community organizer,” says Mara Penfil, co-founder of Female & Fungi and member of the Radical Mycology Collective. The organizers of the RMC would like to invite anyone interested in participating in this event to come and learn, help out, or teach! The RMC is family friendly, non-discriminatory, and donation-based to provide open access to people of all backgrounds. Attendance is based on sliding scale donations,suggested $50-300 for the full event, with no one turned away for lack of funds. Registration includes camping, 3-meals a day plus snacks, and child care. The exact address of the 2014 Convergence will be given upon registration. Mushroom table after a foray at the 2012 RMC. There are several educational tracks offered at the Radical Mycology Convergence. Workshops are led by members of the RMC organizing team as well as volunteers from the larger mycological community. In addition to educational workshops there will be fun, community building activities, like a talent show and a contra dance! Saturday night Passion Show, 2012 RMC. This year, the organizers of the RMC are hosting a pre-convergence work party for 30 lucky folks. Attendees of this gathering will help prepare the land for the installations and remediation work taking place at the RMC and will learn from the organizers in an intimate environment. Projects will include building a huge thermophilic compost pile and greywater trench, preparing substrates for mushroom cultivation, building a community kitchen, and preparing sites for remediation installations. Prep work includes learning about the foundational skills needed to integrate fungi into greywater filtration, erosion control, and revitalizing compacted pasturer land.This work will provide valuable skill sets for those seeking experience in coordinating educational events. 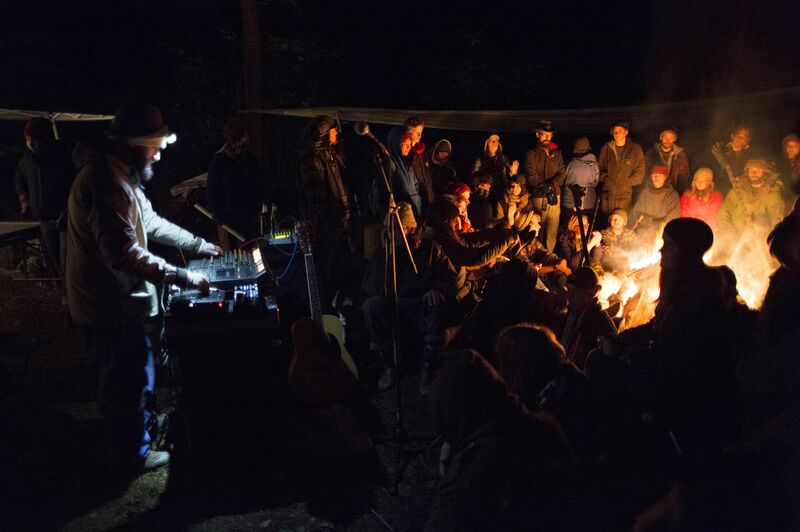 After each workday attendees will rest under the stars, enjoying discussions and presentations around the campfire. The weekend will begin with a communal potluck on Friday evening, October 3rd. Gathering at the 2012 RMC. As the Radical Mycology Convergence is a volunteer-organized and donation-based event, we rely on community support for the success of the event. Monetary donations will be used to cover event insurance, travel fees for presenters, food, cultivation supplies, fuel/energy, bulk spawn, and other event needs. Email radicalmycologyconvergence@gmail.com if you are going to bring any of the items on this list. Tags: amanita muscaria, amazon mycorenewal project, amp, art and science, biology, bioremediation, Can Mushrooms Save the Planet, citizen science, community, community education, death, decompiculture, Do it yourself, earth, Education, Environment, environmental justice, Ethnomycology, female, female and fungi, female scientist, fungal, fungi, Fungus, Gathering Mushrooms, Gordon Wasson, grassroot, grassroots, history, mold, Mushroom, mushrooms, mycelium, mycologist, Mycology, mycomedicinal, mycophotography, mycoremediation, Mysterious Mushrooms, passion, photography, phytoremediation, pollution, psilocybin, radical mycology, Radical Mycology Convergence, remediation, repair, RMC, science, social justice, soil, soil biology, Volunteering, woman, women, Women Gathering Mushrooms, Women in Mycology, women in science, Womyn. Bookmark the permalink.